Everyone loves cookies – it’s a taste of home anywhere, anytime. Our cookies are made fresh and ready to eat. Our gourmet cookies are ideal for any time of the day. Plus they’re so good, you’ll need more than one! Chocolate Chunk Cookie: Hearty chunks of chocolate – Yum! M&M Cookie: Our signature cookie, the Chocolate Chunk, topped with M&M’s. A delightful combination. 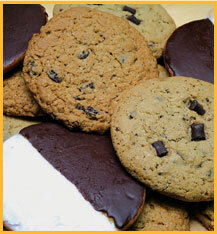 Black & White Cookie: A New York tradition! Gluten Free Oatmeal Cranberry Fruit Cookie**: A medley of fruit inside a gluton free oatmeal cookie!